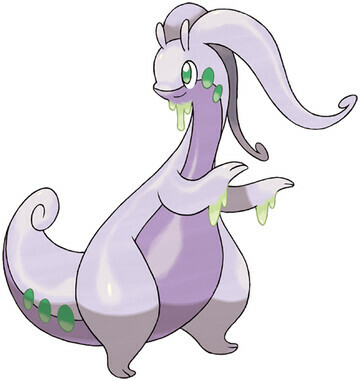 Goodra is a Dragon type Pokémon introduced in Generation 6. It is known as the Dragon Pokémon . The effectiveness of each type on Goodra. It attacks with retractable horns. It throws a punch that’s the equivalent of the force of a hundred pro boxers. An amazingly friendly Pokémon, but if left to itself, loneliness overcomes it, and it oozes gooey tears. It’s very friendly toward people. If you grow close to it, Goodra will hug you with its sticky, slime-covered body. Don’t get mad. Underneath its slimy skin is a thick layer of fat, and the combination of the two makes enemies’ attacks slide right off. Goodra learns the following moves in Pokémon Ultra Sun & Ultra Moon at the levels specified. Goodra learns the following moves when it evolves in Pokémon Ultra Sun & Ultra Moon (regardless of level). Goodra learns the following moves via breeding in Pokémon Ultra Sun & Ultra Moon. Details and compatible parents can be found on the Goodra egg moves page. Goodra can only learn these moves in previous generations. It must be taught the moves in the appropriate game and then transferred to Pokémon Ultra Sun & Ultra Moon. Goodra learns the following moves in Pokémon Sun & Moon at the levels specified. Goodra learns the following moves when it evolves in Pokémon Sun & Moon (regardless of level). Goodra learns the following moves via breeding in Pokémon Sun & Moon. Details and compatible parents can be found on the Goodra egg moves page. Goodra can only learn these moves in previous generations. It must be taught the moves in the appropriate game and then transferred to Pokémon Sun & Moon. What is a good moveset for Goodra? What nature and ability is best for my Goodra? How can I get a Goodra with the move Acid Armor in Sun/Moon? Staller Goodra vs. Bulky Sweeper Goodra? How could you help Goodra get fast enough to be good in competitive play? Specs or Scarf for this Goodra? Is Curse Goodra any good/viable? Is there a way to get a specific ability on a shiny Pokemon?